HOYA has introduced the new Hoya UV & IR Cut filter in 49mm through 82mm sizes. This specialized filter has the ability to cut out both UV rays below 390nm and IR rays above 700mn leaving just the light rays in the visible spectrum passing through the filters and into the camera. This is important because CCD and CMOS sensors are extremely susceptible to UV and IR rays just outside the visible spectrum that have a very negative impact on image quality. The Hoya UV & IR Cut filter blocks both UV rays and IR rays yielding clearer and sharper pictures outdoors. This filter can reduce the effects of atmospheric haze to an even greater degree than a standard UV filter. The Hoya UV & IR light transmission curve shows the sharp-cut nature of the filter glass and coatings as well as the consistent light transmission in the visible spectrum. This curve demonstrates a more even light transmission than the closest competitor. This means that sharper images with more depth and finer, richer color gradations are possible with the Hoya UV & IR Cut filter. 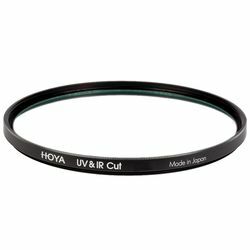 HOYA has introduced the new Hoya UV & IR Cut filter in 49mm through 82mm sizes. This specialized filter has the ability to cut out both UV rays below 390nm and IR rays above 700mn leaving just the light rays in the visible spectrum passing through the filters and into the camera. This is important because CCD and CMOS sensors are extremely susceptible to UV and IR rays just outside the visible spectrum that have a very negative impact on image quality. The Hoya UV & IR Cut filter blocks both UV rays and IR rays yielding clearer and sharper pictures outdoors. This filter can reduce the effects of atmospheric haze to an even greater degree than a standard UV filter. The Hoya UV & IR light transmission curve shows the sharp-cut nature of the filter glass and coatings as well as the consistent light transmission in the visible spectrum. This curve demonstrates a more even light transmission than the closest competitor. This means that sharper images with more depth and finer, richer color gradations are possible with the Hoya UV & IR Cut filter.